When you are working on a project inside OfficeClip, and you need to share a document or a folder with your customers you can do it directly from within the OfficeClip Sharing Application. Web Link: In this mode, the system generates an email that contains a link. On clicking, it provides a way to download the document to the user's computer. This form of sharing can be password protected, and you can also put an expiration date. The password is usually not sent in the same email as the link. Secured Link: In this mode, you first create a login account for your customer. Then you share the document in the same manner as in public sharing, but the customer will have to log in to his/her portal account to see the share. If you have the installed version of OfficeClip, you can go to the OfficeClip download page to read instructions and download the patch. If you are using OfficeClip online at our website they are automatically applied to the site. We have made a service release 10.4.22. This fixes some of the recently reported issues. You can download and install the new release from here. It you are using the cloud edition, it has been upgraded already. Before downloading a document, you can now review it using the in built viewer. Current supported files are office documents (docx, pptx, xlsx), html, pdf, xml, js and text files. 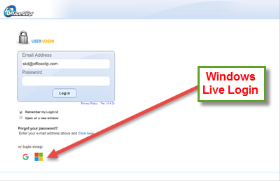 If you have a windows live account, you can use that to login to OfficeClip instead of your OfficeClip login and password. Provide OfficeClip Report Access to certain members (or roles) of your team. Manage Access at the Reports level. For example, do not allow some reports to be shown to an employee. Note: Make sure you exercise caution when you expose your reports to non-administrators of your organization. Depending on their access they may be able to see some information that you may not want them to see! Staging servers are needed when you do not want to put a new release directly into the production environment. You may want to make sure if some new feature needs some training, or your team may feel comfortable testing the new release before putting it in production. This article provides a step-by-step walk-through of creating a staging server. It also explains how you can use a pre-configured amazon ec2 instance as staging server. Note: If you are using OfficeClip from AWS Marketplace, you *DO NOT* need to follow the instructions given below. Your initial password of the created instance is abcd1234@ which must be changed before using the software. Amazon provides a free-tier for its EC2 (Elastic Cloud) on their smallest server (called micro-instance) for one year as long as you are within their limits of access (for limits see http://aws.amazon.com/ec2/pricing/). In most cases you will not have to pay for it in the first year. After the first year you will pay around $15 to $20 per month if you prepay for one or three years. Please visit http://aws.amazon.com/free and the amazon AWS site at http://aws.amazon.com to get more details. We have created an Amazon Machine for you with OfficeClip already installed. The basic version of OfficeClip is free for 10 users. So essentially you can run OfficeClip dedicated server free for one year. Pros: You can dynamically scale processing power, memory and disk space while keeping the information intact. Cons: Amazon Free Tier Micro Instance is a small machine and OfficeClip may run slow. We have tested it ourselves. While most operations are fast, sometimes you may have to wait for a few seconds delay. Cons: Amazon charges for the bandwidth, so you have to be careful. If your machine is compromised by some spyware, it can run up your bills quite a bit. Amazon has alarms to guard against it but most people do not set those. Cons: It is more expensive to host your machine at amazon compared to hosting it on premise if you do not consider human labor cost of installation and maintenence. You can use OfficeClip to share your ideas and notes with your colleagues. In OfficeClip Desktop, click on the Notes application from the left application bar. A list of notes are shown. From here you will be able to create new notes or share them with your team. Each note can be created using the html editor provided and then can be made private or sharable with the organization. Notes, in OfficeClip, can be used to keep track of variety of things. For example, we use it to keep track of our weekly status and plans. You can also use it to store project notes. We have created a new release of OfficeClip (10.1.28). In this release we made OfficeClip more robust by fixing some of the issues that we have been in the previous release. Some of our users have asked us to create a way so that they can put the officeclip login page on their website. Due to security reasons, so far we have restricted people to login from the OfficeClip website. If everything goes alright, it will log you in to OfficeClip, if not you will get a message saying Login Incorrect. Yesterday one of our customers wanted to know how he can invite the employees of a new outsourcing company (he is working with) to OfficeClip but keep them from seeing internal information of the company. Sometimes people have to go extra mile to hide their information. For example, if you want to give access to somebody to your personal computer, you may want to make sure that they do not have access to folders or files on the hard drive. You can run the installed version of OfficeClip on a dedicated server. There is no need to install OfficeClip, the installation is already done for you and you can just configure and run it. You have the flexibility to increase or decrease the machine resources based on your needs. It is cheaper than many dedicated or virtual servers you can find in the market. Use mailmerge to merge contact information with the print campaigns made with Microsoft Word. This week our IIS SMTP (Internet Information Server, Simple Mail Transfer Protocol) server was compromised and spammers were able to get control of it and started sending spams from all over the world. When the server started running low we found that there are around 100,000 spam mails in the SMTP queue (and similar numbers in the Bad Mail folder). Some of our customers did not get some of their mail delivered. We have since corrected the problem. Some of our customers are using SMTP in IIS to send their emails via OfficeClip Installed Version. I will relate some precautions to be taken in such a situation. If the SMTP server gets compromised, check all the blacklists and work with your SMTP to get removed from the list.